In Birdman, Michael Keaton plays Riggan Thomson, an actor famous for portraying Birdman in a series of three movies about the super hero. After he refuses to do the fourth Birdman movie, his career goes nowhere. In an attempt to revitalize his career, he has written a play that he is directing and starring in. The play is getting ready to open on Broadway and he has to deal with an egotistical actor and a critic who promises to destroy the play. In an attempt to make the play succeed, he decides to do something very risky. 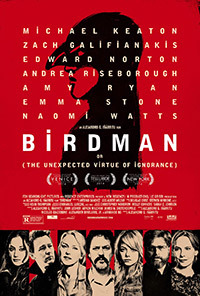 Birdman features an all star cast including Michael Keaton, Emma Stone, Naomi Watts, and Edward Norton. The casting was terrific – everyone does a great job and the whole cast has great chemistry. The movie is shown as one long shot – a technique that is difficult for the actors and editors. I was engrossed in the movie and thoroughly enjoyed it, until the end which is left open to interpretation. Vance, and most film critics, felt differently though. This movie is worth seeing, especially for the acting and the editing and will be out on DVD next week. I have been looking forward to watching this one. It always amazed me when a movie is shown as a long shot. I’ll probably wait for the DVD. I’m curious about this one and will catch it on DVD. Thanks for the review, Kathy. I’m curious about this one. Will get it from Netflix or the library. Thanks for your review! I may watch this eventually…. There has been a lot of discussion about this movie at work; I’m glad it’s coming out on DVD so I can see it. I wasn’t a big fan of the movie. but I agree that the acting was really good. I know that Michael Keaton is certainly one of the frontrunners at the Oscars. I will have to watch for this one, not even sure I missed hearing about it but have always enjoyed Michael Keaton. I definitely want to see this one! I hear the acting is terrific! This is high on my list. I’ve not done a very good job of seeing the Oscar movies this year though. This sounds and looks very good, Kathy! Thanks for the review and trailer. Micheal Keaton seems perfect for this role. We’ll probably skip this one. We don’t go to the movies much unless its a kid movie, but I cannot wait to see this on DVD! I have wondered about this one, but didn’t know much about it until your review, Kathy. It sounds like something my husband would really like. So, I imagine we will watch it at some point. All of a sudden there are way too many movies to see and books to read! Hummmm. I’m quite sure about this one. Of the movies nominated, this is one of the few I actually hope to see. We’ll probably rent this one on DVD. I’ve been patiently waiting for this one to come out on DVD. We don’t often get to see films in the theater as we’re in a very small town. We’re a little behind the times here, lol. We just watched this last night. It was much different than I expected. Great cast though! We thought the acting (Keaton) was great, but the movie itself so so. I also liked it. Bravo! I’m intrigued by this one; I know it has been praised and … not. You provided a great balanced review!